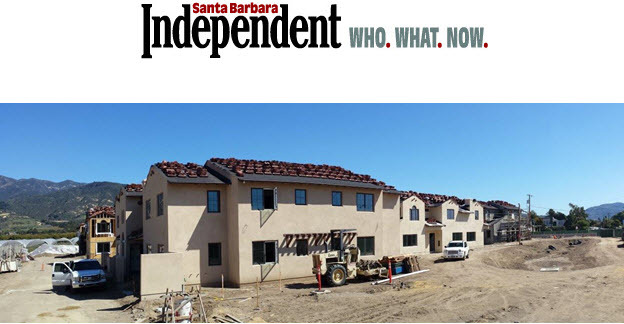 Carpinteria, March 25, 2015 – Peoples’ Self-Help Housing will be holding a lottery drawing April 16 for applicants wishing to live in the all-new Casas de las Flores affordable housing complex, which will open September 2015 in Carpinteria with 43 town house-style apartments. Applicant lottery numbers will be pulled individually from a tumbler during the April 16 drawing to be held live at Peoples’ Dahlia Court IIaffordable housing complex, 1305 Dahlia Court in Carpinteria. The Lottery begins at 10 a.m., and applicants, the media and general public are welcome to attend. As of March 25, 2015 there were over 200 households on an interest list for the beautiful new apartments. A brief pre-application must be submitted before March 31 to be lottery eligible. The pre-application and qualification details are available at http://www.pshhc.org/properties/casas-de-las-flores-lease-up.html. Qualified households’ rent-to-income ratio shouldn’t exceed 40%. Casas de las Flores is currently under construction at 4096 Via Real in Carpinteria, the former site of the Carpinteria Camper Park. Peoples’ purchased the extremely blighted camper park from an absentee landlord more than a decade ago and successfully located replacement housing for the 80 households who were living in very poor conditions on the property. After years of preparation, Peoples’ broke ground on the project in April 2014. Founded in 1970, PSHH is an award winning non-profit organization that develops affordable housing and community facilities for low-income households and homeownership opportunities for working families and special needs populations, such as seniors, veterans, the disabled, and the formerly homeless. With 1,149 self-help homes completed and 1,578 rental units developed, PSHH is the largest affordable housing developer on the Central Coast, with offices in Santa Barbara and San Luis Obispo. For more information on Peoples’ Self-Help Housing, visit www.pshhc.org, email info@pshhc.org or phone (805) 781-3088.
info@pshhc.org or phone (805) 781-3088.